If you are having problems finding or using cheats for an Emulator (particularly MAME/MESS) or have found a trick that you wish to share this is the place to do it. But please read the Cheat FAQ first. Old, but awesome news! :) Which begs the question...how do I code a hotkey to for 2 different buttons to activate 2 different variable for the same cheat? I assigned a different hotkey to each Body Move Set, but they don't activate in-game when i press the hotkeys. This was the only work-around I came up with. So, will have to come up with code to script to the mkla3_hotkeys.json file that will allow me to switch between 2 different Body Move Sets using hotkeys. If I leave the cheats turned off, the hotkey won't turn the cheats on either. I need to write a script that will turn the each cheat on and off when the hotkey for the corresponding cheat is pressed. Even when I manually turn on the cheat, hotkey won't activate the cheat. The Body Move Sets won't change, won't switch on. 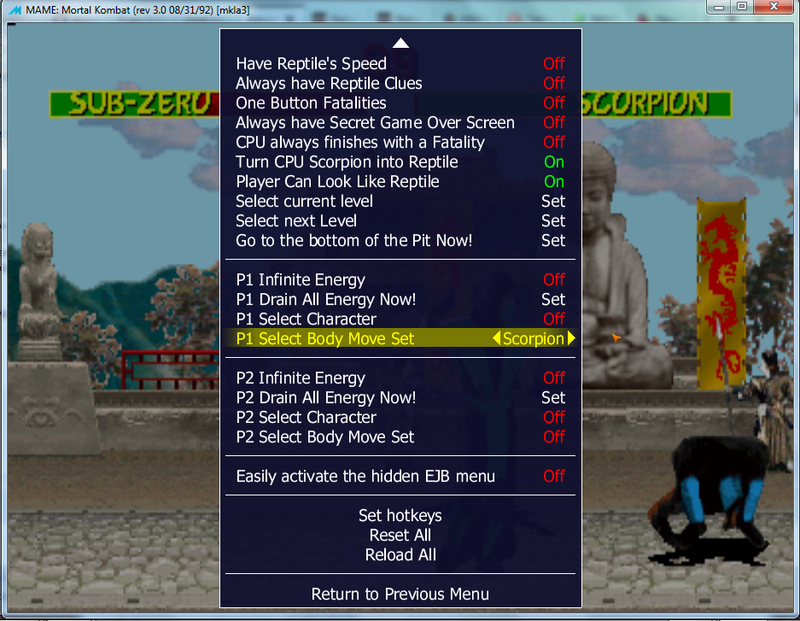 "desc":"P1 Reptile's Scorpion Body Move Set"
"desc":"P1 Reptile's Sub-Zero Body Move Set"
Something like this should work...I used to use a similar method for tetris shape cheats when hotkeys used to work. Pugsy wrote: Something like this should work...I used to use a similar method for tetris shape cheats when hotkeys used to work. UPDATE: Problem was I had an error 201, parsing. So, I grabbed a fresh 0.187 cheat.7z and all was well. These codes display in cheatlist, but they don't work. These ones no funciona correctamente for me. UPDATE: Tested some more. @Pugsy Your code works, just cycles through all Body Move Sets (intended effect). Last edited by mU$!c on Sat Jul 14, 2018 8:15 am, edited 2 times in total. I don't know, you might need to enable bbcode in your User Control Panel? I could add support for this but I don't really know how the ui would work to set it to rotate the options with presses or to just set the one selected. Don' t really understand the question or what it has to do with hotkeys....this seems a LOT off topic. You can make any cheat with enough patience and perseverance, but personally I wouldn't use MAME 0.122( that's over 10 years old ). I'd update to a newer MAME version.